Our spiritual wisdom and understanding is greater when we understand how the brain works. We can then use it to its greatest advantage to understand our relationship with a "god", facilitate energetic healing, mind-body healing, and medical applications of controlled remote viewing. The Paradigm Shift has already occurred! The long awaited reunion of science and spirit is already occuring. New advances in science including information theory and functional neurogenesis have in turn led to new understandings which give a scientific context for spirituality. John Peter Thompson and I have developed a theory of consciousness as being an ecosystem. Complex systems theory explains how right and left brain consciousness work together to create a link to our higher consciousness. Is Intuition the metaphoric equivalence of rain? Read on! Information theory, chaotic systems and complex systems theory finally give us a theory to understand spirituality and the so called paranormal. 1. Introduction to Spiritual Neuroscience (click here) My blog on what is spiritual neuroscience and why should you care. 2. The story of Angela Ronson who was in coma for seven years and made an extraordinary recovery. (click here) She suffered massive brain damage after a stroke and still recovered with personality and memory intact. 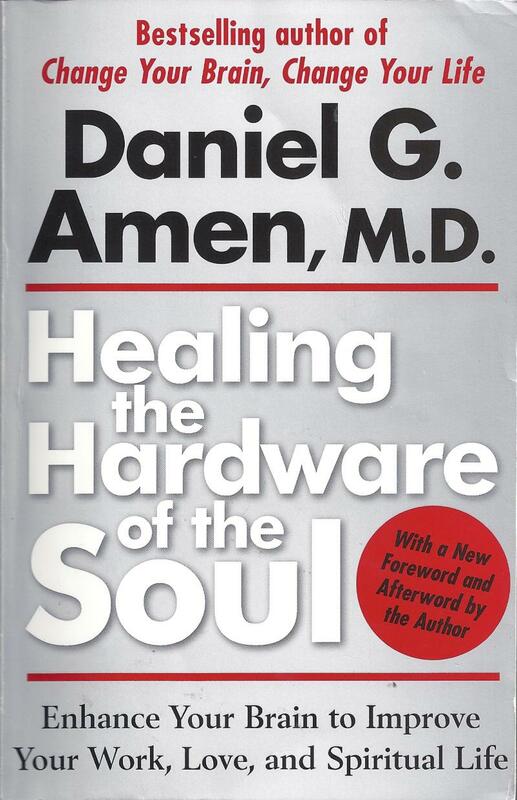 4) Healing The Hardware of the Soul Free Press 2002 Danial Amen MD: The Spect Scan King, also author of outstanding books on ADHD. Healing the Hardware of the Soul. Dr. Amen's premise is that healthy brains are kind, loving brains connected to "god". He is a Christian, and makes that clear in the book. Filled with vitamin, dietary advice, medication suggestions, and neuroscience. 2) Bradley Voytek PhD: has shown consciousness can heal strokes. (click here) He has also developed a research tool for Internet searches. One of the best general blogs on the new neuroscience. 3. Tideliar: He's irreverent! His picture has him defiantly smoking a cigarette. He once swore at me on Twitter and called me "delusional". Yet he will mature into one of the most profoundly spiritual neuro-scientists in our era. He and/or Jason Snyder have my vote to be one of the most influential neuroscientists 20 years from now. Click here for his Blog: It might not be what you are expecting, but it is both hilarious and hard science. 5) The Brain that Changes Itself Norman Doidge Viking Books 2007. Unbelievable book. A scientist teaches blind people to retrain their brains to see. A woman with half a brain acts as if its a whole brain, and many more. Click Here for link to Abstract: Unfortunately, it costs $10 to read the actual article, Published in the Proceedings of the National Academy of Sciences vol 10 no 35 14432-14437 2013. And an additional $10 to read Bruce Greyson's response to the article. 1. Decapitated laboratory rats in the Netherlands show a burst of EEG activity after death. Supports a previous study done at George Washington University showing a burst of EEG activity in humans at the point of death. Click here for report. 2. Sleep paralysis, vestibular motor stimulation and out of body experiences: Cortex Nice discussion of what is the soul, and naturalistic explanations of out of body experiences. 1. Hmmm, turns out we don't have a photographic memory of faces. Instead we encode faces mathematically and then store them in "face space". And where IN the brain IS face space? Click Here Discovery Magazine Article on how humans "see" faces. 7. Can Memories Be Stored Outside the Human Brain? I first proposed that memories could be storied outside the human brain in Where God Lives, in 2002. It raised a storm of controversy, except that there is no current theory of how memories are stored IN the brain. Alan Gauld, in Irreducible Mind (2006) states that "the idea that memories are stored within the brain is a neuroscientic dogma unsupported by evidence." So how could memories be stored outside the brain? 1. Seth Lloyd PhD Physics at MIT states that the Universe is a giant computer. No, not a metaphor, an actual computer processing information. And he says this has been known for over 100 years starting with our understanding of Entropy. Click Here for Part 1 and here for Part 2 of his discussion of this. 2. Article on "Are Memories Stored Outside the Brain" presenting a mathematical model that supports this concept. If Universe is a computer, then Dr. Prince's mathematical model presumably could be operated by the Universe. Our own John Peter Thompson has vetted this article. (click here) Article is from Journal of Nonlocality and Remote Mental Interactions. 5. ﻿Why Doctors Use Treatments That Do Not Work (ed) British Medical Journal 328 28 February 2004 474-475 (click for pdf) A reminder of why we must precisely define the difference between intuition and reliance on ritual, superstition, medical models of disease that are non-scientific and wrong, and the hardening of the brain often passed off as "experience". 2. Josephson BP, Pallikari-Viras Fotini: Biological Utilization of Quantum Nonlocality Foundations of Physics Vol 21 1991 197-207 (Click here for Pdf) The problem is that physicists are writing these kinds of articles and neuroscientists aren't. 1. Non-locality within the brain with regards to color vision. This "curious effect" has been known since 1973. 1. Links to my articles on Spiritual Neuroscience. 2. Articles by Scientists who support Spiritual Neuroscience. 4. Articles with implications for Spiritual Neuroscience. 5. Mainstream Science Articles of interest. Spiritual neuroscience is a scientific model for "top down causation" meaning that consciousness uses the sacred and astonishing mind-brain-body to interact with this Universe. Consciousness uses the brain as a "tool" to interact with this reality. John Peter Thompson has applied complex systems modeling (Turing model of complex systems) to understanding consciousness. We have developed a model of reality which is scientifically and mathematically sound and fits within current scientific understandings. We show that our brains are specifically designed to interact with "non-local reality", "the all information timeless space-less domain", or "god", depending on your specific terminology. 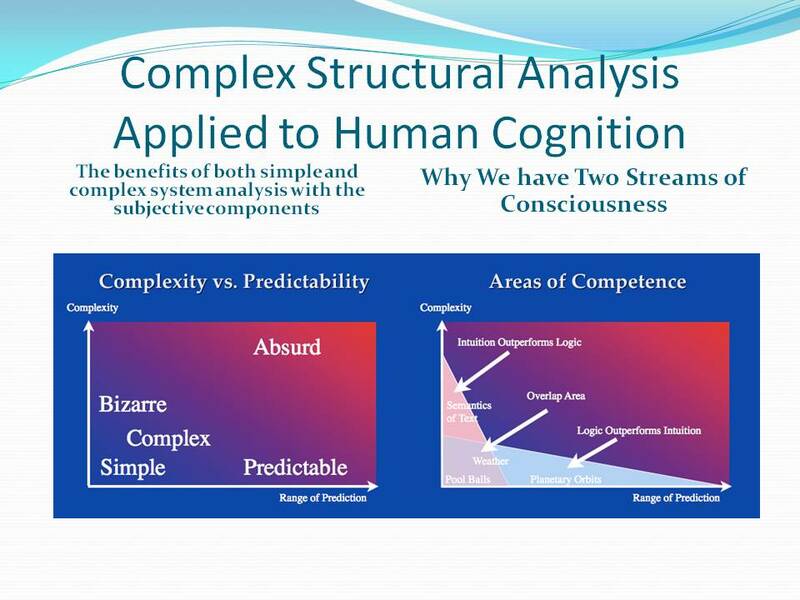 Our model is that consciousness is a complex system that arises out of the two streams of human consciousness known (in a very simple format) as the right and left brains. This higher complex system then feedbacks to the lower system. Specifically this occurs to the left brain as the "internal narrator" or chattering monkey. This feedback comes to our right brain in the form of "intuition", "remote viewing", and energy healing. Click here to read two scientific papers that are the cornerstones of our new theory. Conscious realism is the philosophy embedded in Spiritual Neuroscience. It states that consciousness and life itself create material reality. We need this material reality to interact with each other and learn our lessons of love. I am inspired by physicians and thinkers such as Robert Lanza and Marlene Nobre who state that consciousness is a fundamental property of the Universe. The brain, under this new Paradigm, is what consciousness uses to interact in this reality. Time, space, and the material world are simply tools of the brain to understand reality. 3. Click here for a skeptical analysis of Dr. Lanza's work. The Skeptic is, of course, anonymous as they usually are. However this article is lots of fun even if its pretty vitriolic. 1. 40-50% of the population have had a profound spiritual experience. This experience has made the person more ethical, less afraid of death, more confident. transcendent merging with the Universe. 2. 15% of the population have had a near death experience of some kind, meaning a premonition, shared dying experience, near death experience or after death communication. 3. 7% of the population have had an actual near death experience. 4. 5% of the population have had an out-of-body experience. Spiritists are followers of Allan Kardec. They are typically physicians, neuroscientists, other professionals who are also energetic healers and mediums. They have already integrated spirituality and medicine for over a hundred years. They have a long tradition in the intellectual elite of Brazil, but now are influential world-wide. The US Medical Spiritist Association recently had its third National Conference at George Washington University School of Medicine, in June 2011. Click Here for my blog on the conference. Why Do All the Old Farts Have to Die Off Before New Ideas Can Take Hold?